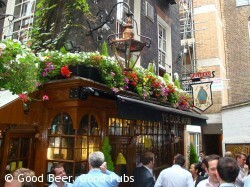 The Old Mitre has been a pub for hundreds of years but it can be one of the hardest pubs in central London to find. It’s not in Hatton Garden, it’s not in Ely Place, but it’s in a small alley between the two. The easiest way to find it is to look for the blue bishops mitre on a post near the southern end of Hatton Garden. Fuller’s who operate the pub now have made it slightly easier by putting their Griffin logo above the entrance to the alley that leads to the Old Mitre. The pub has a number of different areas inside and there is also an upstairs bar you can hire for events or parties. However if it’s not raining (and sometimes even if it is) most people seem to favour standing in the small courtyard space that opens up and surrounds the pub. My father used to lunch here practically every day when he used to work in the area and I’m sure the lunchtime crowds haven’t diminished from those days. My visits to the Old Mitre are evening ones and the pub is no less busy then with office workers, and those who have sought out the pub. There have been a couple of times over the last few years when I have not even bothered to try to get to the bar as the pub was so full. 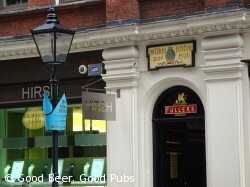 The Old Mitre became a Fuller’s pub early in 2010 but fortunately the varied beer selection has been allowed to continue – although obviously now including a couple of Fuller’s own beers. The pub is the local CAMRA group’s Pub of the Year in 2010. If you’re feeling peckish choose from the varieties of toasted sandwiches on offer at £1.85 – much cheaper than most pubs. I think that more substantial meals are available too but I’ve never tried any of them.